Parts of these videos will go into my upcoming documentary sequel to "Where the Whales Sing". Underwater and aerial video reveals behavior no one has witnessed before let alone recorded, of humpback whales having a 'spa' in a sandhole. 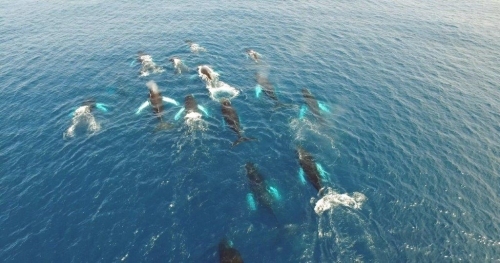 Aerial ultra-high definition aerail video reveals in detail the highly complex social lives of the humpbacks. While the aerial videos answer some questions they beg a lot more. Aerial footage includes 25 humpback whales battling over a female for two hours; aerial footage of dolphins interacting with bottlenose dolphins and dolphins riding on the pressure wave of my boat and the pressure wave on the rostrum of the humpbacks; underwater and aerial footage of nursing mothers; underwater and aerial footage of courting humpbacks and much more.